As a movie lover, I love watching films that were made by fellow movie lovers with “our people” (all of the film-crazed beings of the world) in mind. 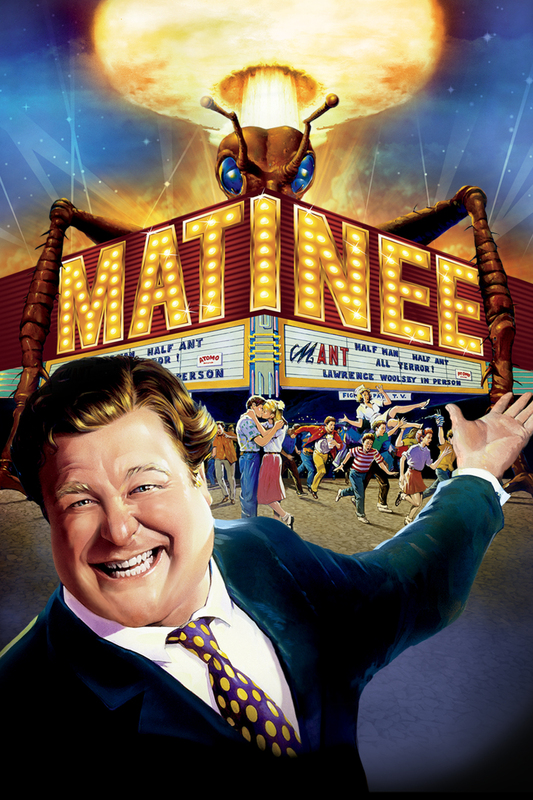 Matinee by Joe Dante is one of those films. Released in 1993 and set in 1962, Matinee is focused on the Cold War experience in Key West, Florida. The first characters we meet, Gene and Dennis Loomis, are young, monster-obsessed brothers who live on a military base. John F. Kennedy interrupts television sets across the nation to warn of the presence of Soviet missiles in Cuba, and filmmaker Lawrence Woolsey decides to capitalize on the atmosphere of fear that is taking hold in Florida after the announcement. Woolsey’s latest film, Mant!, happens to be about killer ant-human hybrids who attack only after atom bombings turn them into frightful creatures. Where better to open a film like this than Key West, Florida, with its military base and close proximity to an apparent atomic threat? In addition to bringing his film to Florida, Woolsey decides to drum up even more publicity for his film by bringing along a couple of pals who will pretend to protest his film. If this Woolsey character is sounding a bit familiar, with all of his gimmicks and big ideas, that’s because he was inspired by none other than the great William Castle. The Cold War era in general receives a partially nostalgic and partially critical treatment in this film, which will likely delight history buffs with a particular interest in 20th century America, myself included. Woolsey also addresses the camera directly in the film’s opening, which has Gene and Dennis at a movie theater watching a trailer for Woolsey’s latest film. Castle was a fan of this tactic, speaking directly to his audience through his previews and film introductions, assuring them of the fright that they would be enduring. 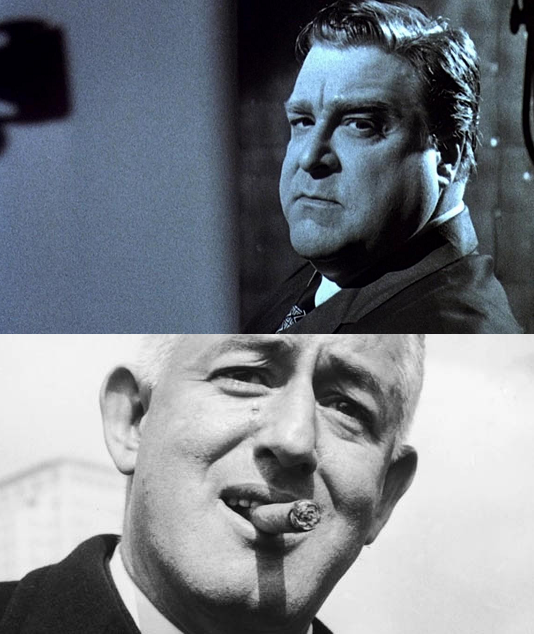 John Goodman’s performance as Woolsey is spot-on. He isn’t directly imitating Castle, but he gives the same kind of cheeky, self-aware delivery that can be seen in Castle’s own on-screen appearances. Castle and Woolsey know they’re cornballs, but they’re also dead-set on convincing you otherwise. The script has this same sense of self-awareness, with Woolsey pointing out “scientific” evidence to his audience and trying to emphasis the “IT COULD HAPPEN TO YOU!” aspect of his latest story. Just as much credit must be given to Charles Haas as to Dante for this film’s success as an homage to the horror-corn of the past, since Haas wrote the screenplay. And what would a Castle tribute/spoof be without a nod to his famous theater gimmicks? In the case of Woolsey’s Mant!, the director announces that the film will be accompanied by “Atomovision.” Little buzzers are attached to the seats in the local theater, just as they were for Castle’s The Tingler. Attendees must sign a contract with a “nurse” in case they die during the screening. Woolsey even shows up at the theater and hands out free passes to his latest film to counteract the fake protest he created! 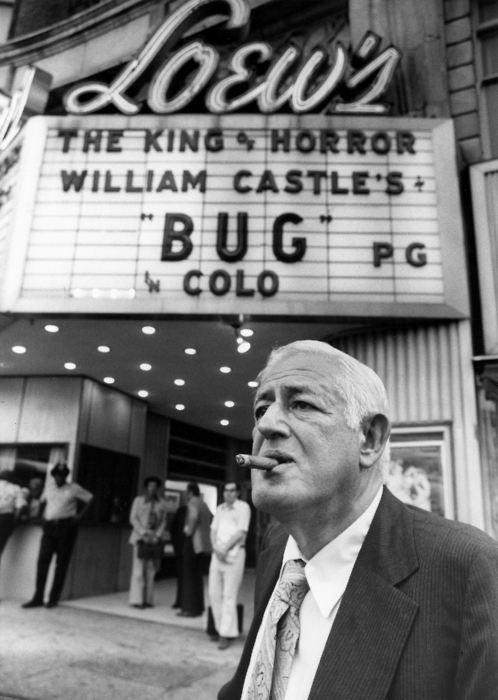 Matinee does more than just reference William Castle. A poster for Roger Corman’s Tales of Terror starring Vincent Price appears in one scene, and the theater marquee announces screenings of Burn, Witch, Burn. Posters for The Day the Earth Caught Fire and Panic in Year Zero appear inside of the theater on the night of the screening. American International Pictures, a studio famous for B movies, is spoofed in the opening credits of Mant!, which list ‘Woolsey International Pictures’ as the production company. Classic family films are spoofed as well, with an incredibly silly “film within a film” about a shopping cart that comes to life — Gene and Dennis are forced to watch it when their mother tells them to see something without monsters in it. William Castle’s influence is most apparent, though, and Joe Dante and Charles Haas clearly have all of the knowledge of and respect for Castle’s work required to pay tribute to it successfully. Even the duality of fright and silliness in Castle’s films is emphasized by Matinee, with younger brother Dennis becoming frequently scared during that Mant! preview in the opening, while Gene acts aloof… but finds himself jumping, too, eventually. 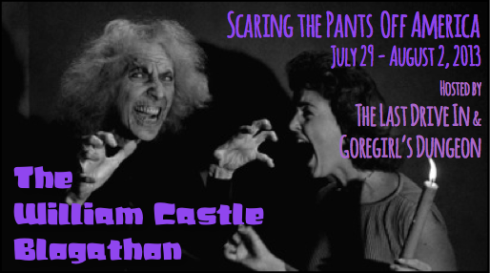 I consider Matinee a must-see for fans of William Castle or for mid-century buffs of any type. It’s an extremely entertaining film in its own right, but is especially enjoyable for its homage to one of my favorite filmmakers, William Castle, the king of the corn. My pleasure! This was a really fun piece to write. I stumbled upon Matinee while researching the bio I’m posting on Castle later in the week. I’d never even heard of it until then!